This exciting set of commemorative stamps was issued to celebrate the exhilaration and binding power of the Olympic spirit. 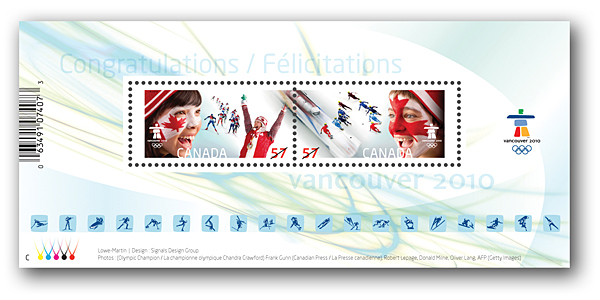 The backgrounds of the stamps capture the energy of the Games with photographs of three sports: four-man bobsleigh, women’s cross-country sprint, men’s short track relay speed skating. As well, Chandra Crawford is shown accepting her gold medal at the Torino 2006 Winter Games. This souvenir sheet consists of the two Celebrating our Olympic Spirit stamps.